My local market, the one whose bakery always makes me slow down to swoon and drool, sells pudding cakes. Chocolate chip, coconut, blueberry, pick your flavor. Prominently on display, I walk by them several times a week and feel a tickle in my taste buds. I've only tried their pudding cake once, and it was the perfect combination of coffee cake and bread pudding. Moist, rich, and oh-so-flavorful. This was my attempt to recreate that deliciousness. The result? Amazing but not at all like the original. Although this is one of my new favorite breakfast-y cake recipes, the texture wasn't at all like the one I was hoping to mimic. While this cake was moist, it had a crumbly, almost cornbread-like texture to it. It was light and intensely infused with the blueberry flavor, but not in an overpowering way, which made me very happy. Do you have a favorite pudding cake recipe? I'm still on the hunt. 1. Put oven rack in middle position and preheat oven to 375°F. Butter a 9-inch round (preferably springform) baking pan. 2. Stir together 1/3 cup sugar with water, lemon juice, and cornstarch in a small saucepan, then stir in blueberries. Bring to a simmer, then simmer, stirring occasionally, 3 minutes. Remove from heat. 3. Whisk together flour, baking powder, salt, and remaining 1/2 cup sugar in a medium bowl. 4. Whisk together egg, milk, butter, and vanilla in a large bowl, then add flour mixture, whisking until just combined. 5. Spoon batter into baking pan, spreading evenly, then pour blueberry mixture evenly over batter (berries will sink). If using a springform pan, place pan on a foil-lined baking sheet to catch any leaks. Bake until a knife inserted into center of cake portion comes out clean, 25 to 30 minutes. Cool in pan on a rack 5 minutes. Cake can be made 1 day ahead and cooled completely, uncovered, then kept, wrapped well in foil, at room temperature. i actually had to stop and think--have i ever made a pudding cake? have i ever eaten a pudding cake? the sad answer to both is no! 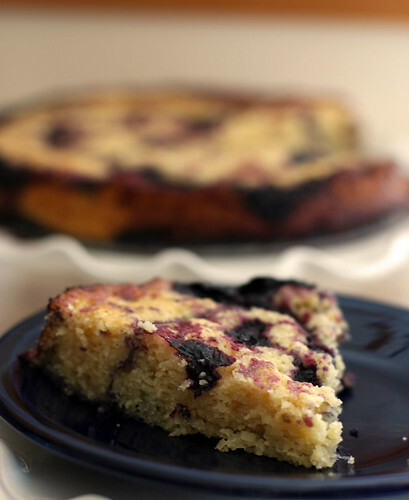 i love blueberries, so i think that when i make my pudding cake debut, it'll be with a recipe like this one--thanks for sharing it!